A dog might see a cat outside the window. The dog can't get to the cat, so she attacks the closest thing instead. Some dogs might bite the curtain, some dogs might snap at the closest animal (a sibling). Some dogs might even bite the pet parent. 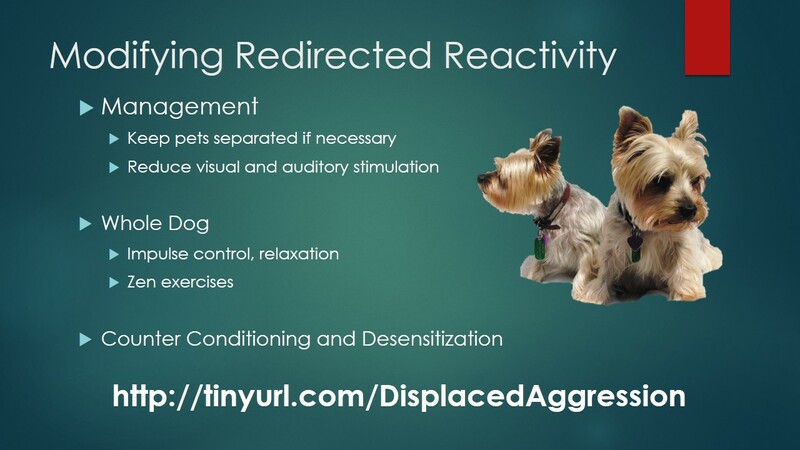 When trying to fix redirected aggression, the best course of action is the help the dog feel better about the cause of the redirecting. Impulse control and stress reduction can also help. But in order to keep everyone safe, we have to start with management. 1. If the behavior is serious enough, pet parents might have to consider keeping the animals of the household in separate rooms or separate crates. Some people call it "crate and rotate." I call it "musical rooms/crates." - One pet is put away while the other has free reign, then switch. 2. Number 1 can be too drastic for some pet parents. There are other options. B. 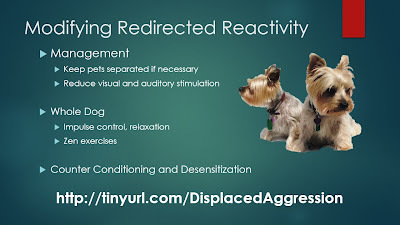 Getting dogs further away from the source of frustration can help as well. - A simple way to do this is to hand our dogs treats as soon as the concerning thing comes into view. Pet parents should never counter aggression with aggression. Do not yell, nor yank, or hit. This will make the issue worse. Startle and other suppression methods are also highly discouraged. A medical evaluation might be in order. If this issue is serious and/or if none of the above works, it might be wise to call in a professional. Pet parents have to be careful. Some incompetent "professionals" will not only make the issue worse, but also, they can even emotionally scar a dog for life. Tell us about your redirector in the comments below.